Dammit, I did it again. Got all into blogging, for like two and a half weeks, and then I did the disappearing act again. How does that happen, and how do the weeks fly by just that fast? According to blogging etiquette or mores I'm not supposed to mention and/or apologize for the fact that I went incommunicado again. (Evidently people hate that. It makes them roll their eyes.) It's just...I disappear for a month, and then jump right back into the deep end? That doesn't feel right, either. So sorry to make you roll your eyes back into your head, oh you hipster-daily blogger, you. But before I get back into talking about books and decor and writing (oh yeah -- that) and whatnot...here's a quick little travelogue of places I've been since last I posted. event, but it's always good to get out to Palm Springs. The weekend after that, there was a day-trip out to Hollywood to play tourists. In the middle of the following week, I drove out to meet a Canadian friend who was in town. We met up at Fashion Island. The sunshine wowed my friend and made her happy. The Jonathan Adler store wowed me, and made me very, very happy. In the middle of all that, my daughter turned 9. Here she is, posing after the Nordstrom Spring Fashion show that she participated in with her Brownie troop. photo, of the sailor kissing the nurse on V-Day? (D-Day?) This was in San Diego. And of course, there's always Disneyland. And somehow, even in the midst of all that busy busy time, I was still able to write a bit. Emphasis on "bit." I wrote about a girl named Shayla that I knew in the 5th grade. 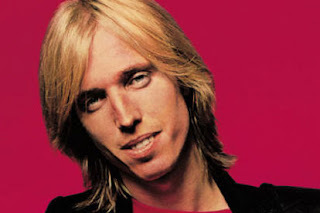 And how she bore a strong resemblance to Tom Petty. But then Spring Break hit my house and I stopped writing anything at all. And I've been increasingly cranky and testy and generally fed up again and I know I need to get back to the yellow legal pad. As for today, at least I'm back here.